New release on GentleJunk co. NetLabel at GentleJunk co.
Alexandre Torres Porres is a musician from Brazil with Master’s Degree in Composition and currently at a doctorate in Computer Music. Interested in many things from Brazilian Pop Music, Erudit to Noise. He also signs some of his stuff under Mental Osmosis and is the newest addition to LiveNoiseTupi. In this compilation, you will find some assorted productions. He acts as a composer, performer, and gets sounds out of many instruments at his home studio, but really studies how to use the computer as an instrument, for productions and live performances. 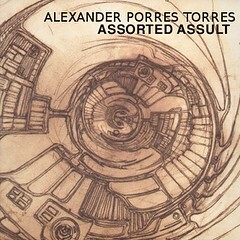 More on Torres Porres work http://porres.googlepages.com/. Recorded at ATP home studio in 2007/08.